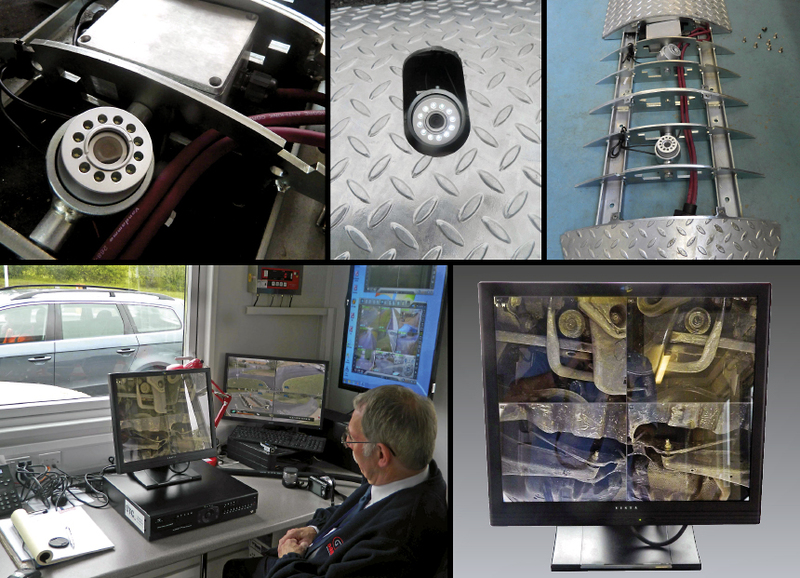 The S-COMM under vehicle inspection system (UVSS / UVIS) is designed for quick and easy installation. The unit arrives crated with top covers in place, if you are planning on a temporary siting of the UVSS for low traffic volumes at low speeds the unit can be simply placed in the location you wish, if you are planning a more permanent or semi permanent siting, to start the installation procedure simply remove the top covers with an allen key and place the UVSS structure in the position required. Inside the UVSS you will see two pre-holed channels running down each side of the system. Depending on the type of surface you intend to fix the system to you select the appropriate bolting method and using the holes in the UVSS channel locate the system by bolting it to the surface of the road. Once this is done you can replace the outer covers and connect the DVR to the monitor and power supply, followed by connecting the individual camera coax’s to the numbered ports on the back of the DVR. The system is then ready to boot up. No compromise is made in the build quality of the S-COMM, UVSS / UVIS. It has an extremely strong internal skeleton which is covered in a thick galvanised steel external skin. As you can see from the video it can easily handle multiple heavily laden HGV’s time and time again.